CLICK HERE TO VIEW OUR WORKSHOP CALENDAR! WATCH THE VIDEO ABOVE TO LEARN MORE ABOUT OERB WORKSHOPS! The Oklahoma Energy Resources Board provides free workshops for Oklahoma teachers in K-12th grade. At the workshops, teachers will do hands-on activities and learn from the OERB Master Teachers. Lunch is provided. Educators leave the workshop with a box of all the supplies needed to teach the curriculum in their classroom, so teachers don't have to purchase the materials themselves. Written for Oklahoma teachers by Oklahoma teachers, the OERB's hands-on curricula is as exciting to teach as they are to learn. For more information, contact the OERB at 1-800-664-1301 ext. 233 or e-mail teachers@oerb.com. 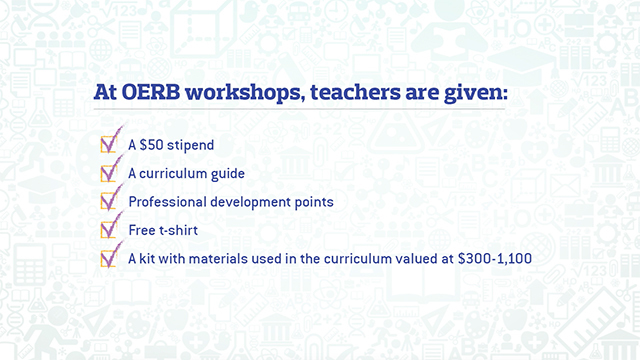 Each workshop offers all nine of OERB's curricula. Spaces are limited for each workshop. Sign up early to attend the date of your choice. Registrants who sign up after a workshop is filled will be put on a waiting list. Little Bits- Curriculum for grade levels K-2. Little Bits has eight lessons which cover reading, social studies, math and science standards while teaching about sound vibrations, force, physical properties and well site safety. This hands-on curriculum makes it fun for students in grades kindergarten through second to learn basic concepts about earth science, physical science and math through hands-on activities. Educators receive six professional development hours for attending this workshop. Fossils to Fuel- Curriculum for grade levels 3-6. Fossils to Fuel is a hands-on science curriculum to help students learn about energy sources, geology, density, matter, porosity and sound waves. These eight lessons also teach math concepts like measurements, mass and volume, data organization, decimals and fractions. Educators receive six professional development hours for attending this workshop. Fossils to Fuel 2- Curriculum for grade levels 3-6. Fossils to Fuel 2 is a continuation of the original Fossils to Fuel program. Students studying Fossils to Fuel 2 will team up with Petro Pete, OERB’s energy mascot, and learn how to use a dichotomous key to identify Oklahoma rocks. Students will also use an animated geologic computer model to “look” below the surface of Oklahoma, use viscosity tubes to study flow rate, use ordered pairs and a coordinate grid to locate Petro Pete, and study rocks, crude oil, porosity, pulley systems, cohesion and recycling. Educators receive six professional development hours for attending this workshop. Petro Active- Earth Science curriculum for grade levels 6-8. Petro Active teaches middle school students about the formation and recovery of oil and natural gas and includes classroom energy experiments. In seven lessons, Petro Active covers science topics such as geologic timescales and processes, wavelength, amplitude, frequency, distillation, seismology and conservation. Educators receive seven professional development hours for attending this workshop. Rockin' Ratios- Mathematics curriculum for 5th grade through pre-algebra. Rockin' Ratios has three lessons covering mapping, tangrams, slope, algebraic reasoning, ratios and proportional relationships. Students will practice these concepts and learn more about how land descriptions are used in the energy industry, how the concept of slope is used in directional drilling and will complete the curriculum by designing their own storage tanks by calculating volume and surface area.Educators receive six professional development hours for attending this workshop. CORE Energy Science- Curriculum for secondary science teachers teaching physical science and above. Core Energy Science exposes high school science students to flow rate, hydrocarbon structures, fractional distillation and bioremediation in four lessons. Educators receive seven professional development hours for attending this workshop. Educators receive seven professional development hours for attending this workshop. CORE Energy Social Studies- Curriculum written for secondary social studies teachers (Oklahoma History and up). Core Energy Social Studies uses eight lessons and focuses heavily on Oklahoma History, but also contains lessons on the US economy, the 1970s energy crisis and a history of Oklahoma’s energy industry. Educators receive six professional development hours for attending this workshop. CORE Energy Math- Curriculum written for secondary mathematics teachers (Pre Algebra and up). Core Energy Math contains three lessons which meet the Pre-Algebra, Algebra 1 & 2 and Geometry state standards. They cover revenue/expenses, angles, functions, graphing and rate of change. Educators receive six professional development hours for attending this workshop. CORE Energy Language Arts- Curriculum written for secondary language arts teachers (grades 9-12). Core Energy Language Arts is comprised of four lessons about detail and tone, textual evidence and inferences, using historical fiction, rhetoric, and pathos, logos and ethos. Educators receive five professional development hours for attending this workshop. After your class completes the curriculum, you can also submit an application for a FREE field trip to one of 16 exciting museums across the state. To view our list of eligible museums, click here. For a listing of workshops in your area and to register, click here.